I have almost hit the landmark of 100 recipes on my blog. It's taken a while as I post just one recipe a week. 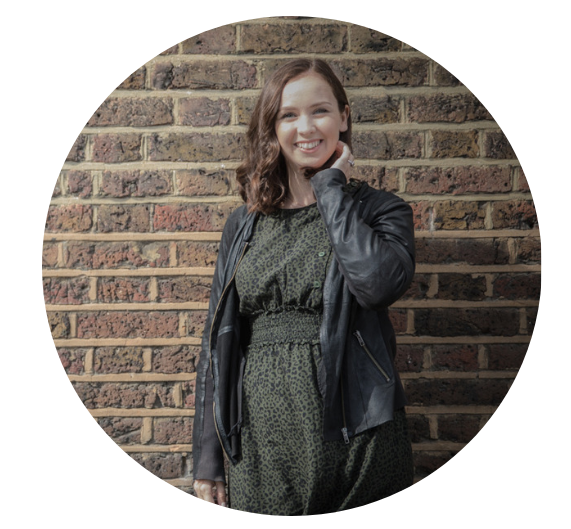 But when I get there that will be 100 weeks which would mean that I have been blogging for almost 2 years, which is about right! Flicking back through my recipes something stood out to me: I don't have any salad recipes. For a healthy eating blog you might think that's a pretty big omission. But here's the thing.... I'm not actually a massive salad fan. I've never been totally in love with absolutely loads of raw veggies on one plate and you can forget iceberg lettuce, that won't ever be appearing on the Pantry! However I do make a version of what I consider a 'salad'. It's got some of the elements you might expect: salad leaves (though no iceberg), nuts and seeds, a grain to make it filling and a dressing to bring the flavours together. But I like to have hot elements if I can and for this recipe I've got quinoa and roasted broccoli which is a total dream and so quick to do. 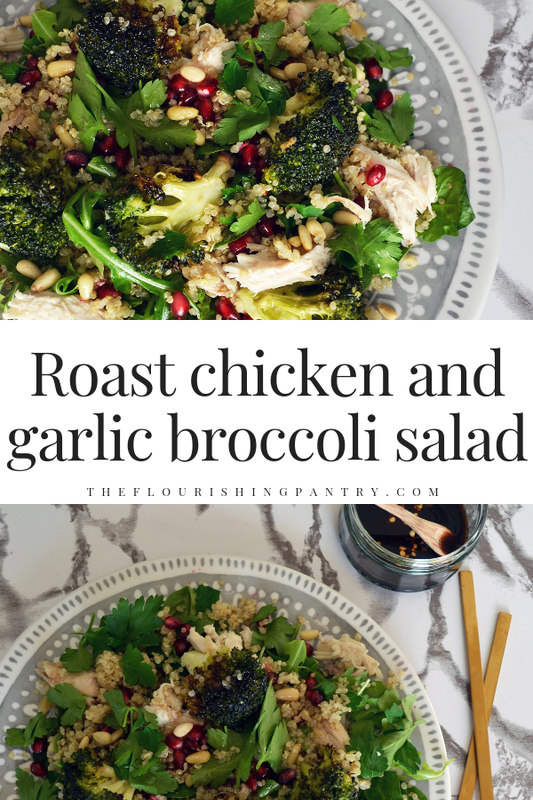 The broccoli adds a lovely change of texture to the salad and if you cover it in all the garlic I recommend it's absolutely scrummy! I've also included roast chicken leftovers in this recipe. Most Sundays we cook a roast and have loads of meat left for the week for sandwiches, risottos or stir-fries. I also make stock using the bones, together with onion, carrot, bay leaves and peppercorns; this is a great basic stock recipe if you're interested. I wanted to show that this is a recipe that can be done with something you already have - food waste is something I've banged on about over on the Health Bloggers Community Magazine before, and something I will be touching on in a future blog post here on the Pantry. I don't think you need to buy in bags of new ingredients just to make one recipe, you can use what you already have in the house to great effect and much lower cost. So tuck in and see what you think. This also works well cold, for all I've said about the hot elements! I had a second portion straight from the fridge the next day and it was total perfection. 2. Place the broccoli florets and stems in a baking tray and toss them in the olive oil and minced garlic until they're fully coated and the garlic is evenly distributed. Put the tray in the oven and roast for 20-25 minutes, until the broccoli is just starting to crisp and brown at the edges. Remove from the oven when done. 3. Cook your quinoa to packet instructions. If you made chicken stock with your roast chicken carcass then I highly recommend using the stock instead of just plain water to make your quinoa. It really adds amazing flavour, but isn't essential. Just a suggestion! 4. Heat your chicken if you'd like this hot as well. I popped mine in the microwave for ease, but you could also put it in the oven to heat through. Or just use it cold. 5. In a small bowl whisk together the lemon juice, balsamic vinegar and chilli flakes. This is your dressing which can be drizzled over the salad when it's ready. 6. Start to assemble your salad in a large bowl. Add your salad leaves as the base, mix through the parsley, sprinkle over the pine nuts, pomegranate arils and finally add the quinoa, broccoli and chicken and toss together to combine. I like the way that the hot elements wilt the salad slightly! 7. Serve with a drizzle of the dressing and enjoy. Pin this recipe to Pinterest to save for later!